The Mantis deck clip system leave no visible fasteners on your deck surface, and is the perfect choice for grooved deck boards. Just slide the Mantis Clip into the deck board groove and fasten to the joint. It’s that simple. Easy to Install – No fasteners on deck board surface–even on the first and last boards. Watch these short installation videos demonstration of the Mantis Clip System. Each box will fasten 50 sq. ft. decking based on 16” O.C. joists. 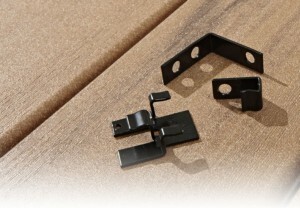 BONUS – FREE STARTER AND FINISH CLIPS included with screws. Each carton includes 90 Mantis™ Clips + 5 starter clips + 5 finish clips and all the fasteners needed to install.